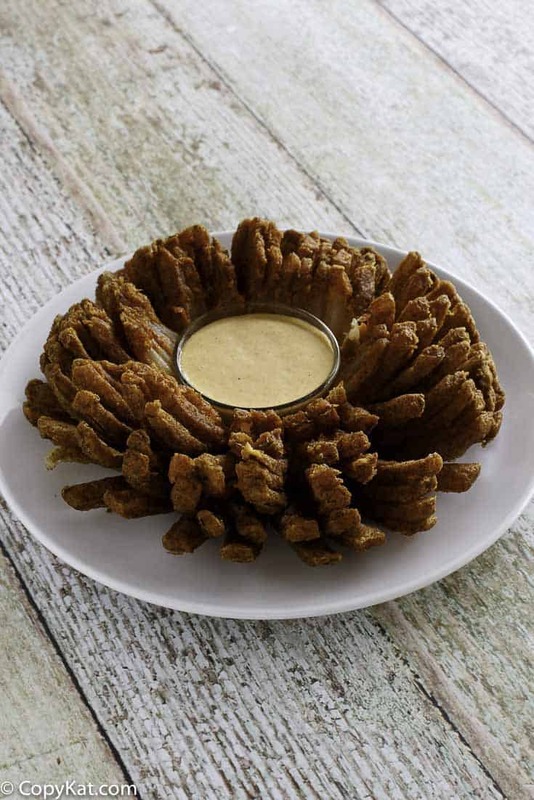 The Outback Steakhouse Blooming Onion is a treat the Outback Steakhouse has been serving up since they opened. 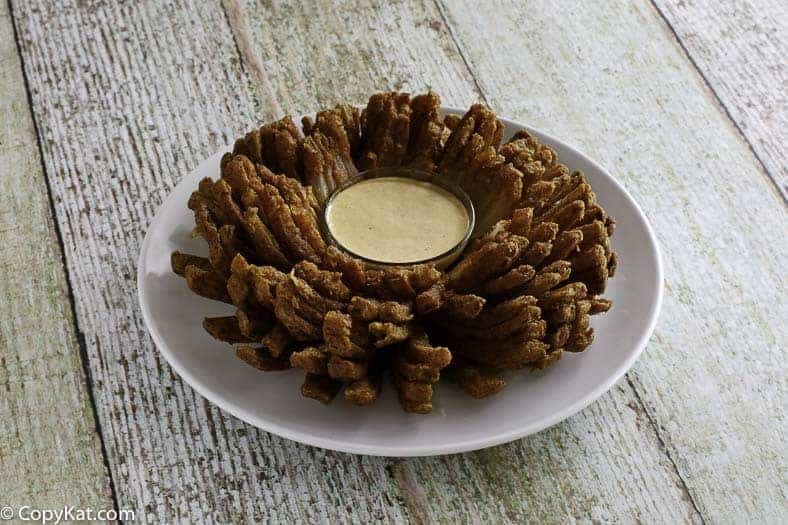 You can make this appetizer menu item just like they do, and you don’t need any fancy tools to prepare this Bloomin Onion. I think this one of one my first copycat recipes. I can remember the first time I tried this bloomin onion. An onion is sliced in a way that it opens up, some might even say it “blooms”. The petals are battered, and the onion is deep-fried and then this creation is served with a wonderful sauce. I know you will be blown away just like I was the first time I tried this creation. 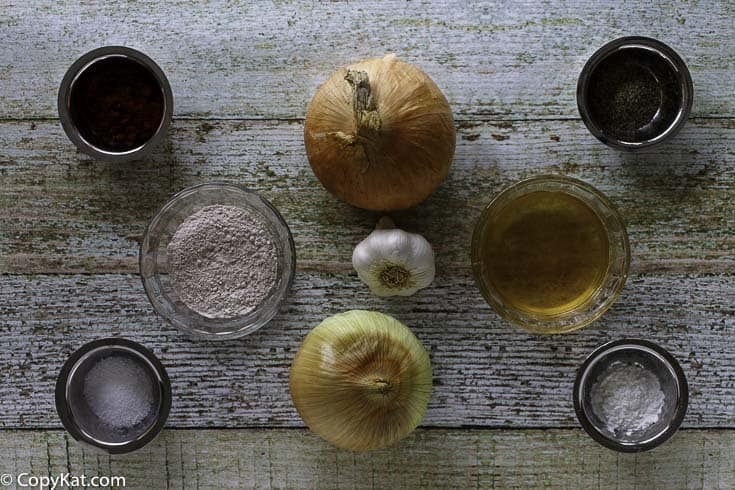 Preparing this onion isn’t too difficult, the ingredients are fairly simple. You are going to need large sweet onions. A Vidalia or even a 1015 onion will do. A large sweet onion will give you the perfect flavor. You will also need some beer, flour, spices, and cooking oil. My preference for cooking oil is peanut oil followed by vegetable oil. Any liquid oil will do, but I think peanut makes the onion more crispy. To cut the onion grab a sharp knife, and you may want to make sure your cutting board is has a damp cloth under it so it doesn’t move. Peel the onion, place the root end on the cutting board. Slice the first 3/4 inches off the top of the onion. Then you will make 10 to 12 verticle cuts, but don’t go all of the way to the root. Then you can try to separate some of the petals, but not too much, you may break the onion. Dip the onion in flour, this will help make the batter stick. Dip in the batter, then it goes into the fryer. If you feel cutting the blooming onion is too much, then try cutting it petals, or strings, or even onion rings. Be sure to serve it up with plenty of dipping sauce. Do you love the Outback Steakhouse? Try these recipes. 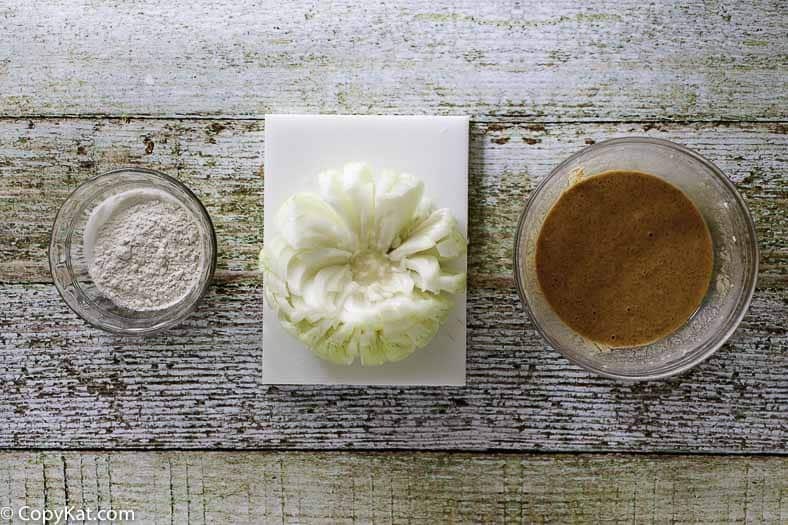 You can make some magic in your kitchen when you make this blooming onion at home. Combine and mix well. Mix cornstarch, flour, and seasonings until well blended. Add beer and mix well. Cut about 3/4" off top of onion and peel. Cut into onion 12 to 16 vertical wedges, but do not cut through the bottom root end. Remove about 1" of petals from the center of the onion. You may want to separate the onion petals slightly, but do not do this too much or you will destroy the onion. Dip onion in seasoned flour; remove excess by shaking. Separate petals to coat thoroughly with batter. Dip in the batter. Dip in flour mixture again. Gently place in fryer basket and deep-fry at 375 to 400 degrees for 1 and 1/2 minutes. Turn over and fry an additional 1 and 1/2 minutes. Drain on paper towels. Place onion upright in a shallow bowl and remove center core with circular cutter or apple corer. Serve hot with Creamy Chili Sauce. We can try to get close to their recipes. The main thing they do is all of the seasonings for everything is shipped in. They are locked up. There isn’t beer in this dish at all. There is a machine that is used to cut the onions. Then they have to be soaked in water ton get them to open. What can I substitute the beer for? I would try club soda. What about an alcohol free beer like O’Doule’s ? If gluten is the issue instead of alcohol, there are now some gf friendly varieties available that would work. Without that beer-y flavor, the batter is just not right. There is no substitute for beer!! lager, ale, porter, stout etc. Is it all purpose flour or self rising? Tastes just like outback! If you have no taste buds…. Followed the recipe to a “T” without any problems, just tasted awful. Rather whoever wrote this had no taste buds, or has never had a bloomin onion at outback! You can make your own version of the Outback Steakhouse Dipping Sauce at hom. InstructionsCombine all ingredients and mix well. Cover and place in the refrigerator for at least 30 minutes before serving. Here is the link to the dipping sauce. This should be served with the dipping sauce for the bloomin onion. The onion will come out better if, after slicing the petals, you float the onion upside down in ice water for fifteen minutes. The water must be as cold as possible. It will spread more easily, and lose fewer petals. This is how Outback gets it to bloom so nicely. Is there anything i can substitute for the 12 oz. of beer? You could try some club soda. I don’t know how well it would work, but it would be better than using plain water. how do I make the creamy chili sauce? Tried the Hooters fried pickles recipe the other night and it turned out great..I tried this recipe (Bloomin Onion) tonight and what a disaster..lol..The batter was so thick that I couldn’t get the onion into it without the onion breaking into pieces, plus after dipping it into the flour mixture, the batter wouldn’t stick to the onion. I ended up adding some bear to the batter to thin it out a bit but it didnt help. After dipping it into the flour mixture, it just wouldn’t stay on the onion..Any suggestions?? In the future, I will try to shoot a video on this one, so the technique is more apparent. Make sure the onion is dry, and coat it with starch first. Usually it’s easier if you also place it in the refrigerator for 30 minutes to chill down. Then do the batter dip after. Once you did the batter, put it on a rack for a minute before you do a second coat of flour. Thank you for the helpful tips. when you added the bear to the batter… did he get upset? New to your site – like it so far!